Places Covered : Delhi - Udaipur - Jodhpur - Jaisalmer - Bikaner - Mandawa - Agra - Khjauraho - Panna - Varanasi - Delhi. Upon arrival at International Airport/Railway Station in Delhi, Grand Tours India Representatives will greet and assist you to transfer to the hotel. Spend rest of the day in comforts at hotel. 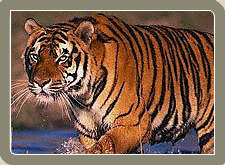 Places Covered : Delhi - Bharatpur Bird Sanctuary - Sariska National Park - Ranthambore National Park - Agra - Delhi. Places Covered : Delhi - Jaipur - Ranthambore - Bharatpur - Agra - Bandhavgarh - Kanha - Jabalpur - Delhi. Ranthambore Tiger Reserve, at the junction of the Aravalis and the Vindhyas, is a unique example of natural and historical richness, standing out conspicuously in the vast, arid and denuded tract of eastern Rajasthan, barely 14 kilometers from Sawai Madhopur. It spreads over a highly undulating topography varying from gentle to steep slopes; from flat topped hills of the Vindhyas to the conical hillocks and sharp ridges of the Aravalis, from wide and flat valleys to narrow rocky gorges. Places Covered : Delhi - Umaria - Bandhavgarh - Katni - Delhi. Early morning arrival at Umaria railway station. Meeting and assistance at railway station then transfer to Bandhavgarh Jungle Lodge. Afternoon Jungle excursion by Jeep & elephant (subject to availability). Meals & overnight at lodge. 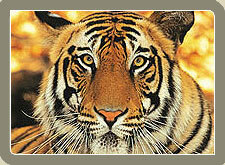 Places Covered : New Delhi - Ranthambhore - Agra - Kanha - Bandhavgarh - Kaziranga. In the morning you will be transferred to the train station to board the train to Sawai Madhopur. On arrival you will be received and assisted to your hotel. Relax for a while. Move out for a Jungle safari for wild life viewing. Evening free to explore around.